Most plant pests are shy creatures who prefer to lurk in dim crannies where they can’t be easily detected. Not aphids. These bold, gregarious insects work right out in the open. On infested plants you can find entire colonies of them cavorting on new growth, at the base of buds, and on the undersides of leaves. Usually less than 1/8 inch long, commonly greenish white or black, aphids have soft, pear-shaped bodies, long legs and antennae. Most are wingless, but winged versions appear when a colony gets too crowded and decides to migrate to another plant. 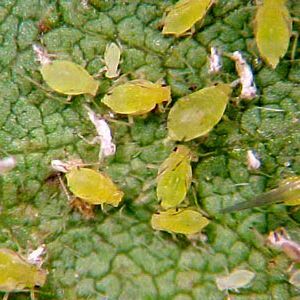 Aphid feeding causes poor growth, stunted plants or curled and distorted leaves. Developing aphids shed white skins. A pile of them on upper leaf surfaces may be your first sign that these destructive insects have arrived. In the process of sucking out plant juices, aphids – like mealybugs and scale – excrete a sweetish, sticky “honeydew” that often turns a moldy black and may lure ants. Aphids also carry viral diseases to plants. Females seem to like enormous families. A single aphid typically gives birth to between 60 and 100 young ones every day-for a period of 20 to 30 days. And each of her daughters is able to reproduce within seven to 10 days. Their high birth rate, coupled with aphids’ ability to sprout wings and migrate, means you should take action as soon as you spot them. Immediately isolate the infested plant, or any other plants in your house might be settled by a new colony. Fortunately, new aphid populations aren’t difficult to get rid of. Wash the foliage in soapy water-rinsing with a sink sprayer if possible-and they’ll usually leave in a hurry. Don’t be deceived, though; new generations may crop up, so check and treat again after seven days. For best results, repeat a third time. If a plant has only a few aphids, you may be able to control them by dabbing with a cotton swab soaked in rubbing alcohol.